The celebration of Candlemas on the 40th day of the Christmas/Epiphany season, originated in the late fifth century as a day of light and hope. The name was derived from Luke 2:22-40, where Simeon declared Jesus "a light of revelation” to the world. This celebration also honors the renewing of light that comes in the natural world at this time of year, the midway point between the winter solstice and spring equinox. All are invited to Pathways Retreat’s celebration of Candlemas in the Retreat House. 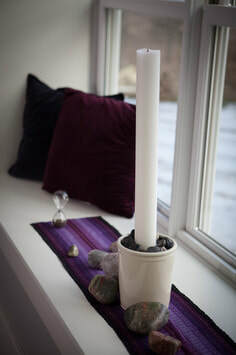 In this simple service of light and blessing, the candles to be used this year at Pathways Retreat will be blessed to be a sign of the eternal brightness that illumines all of creation. You are invited to bring your own candles for blessing as well.